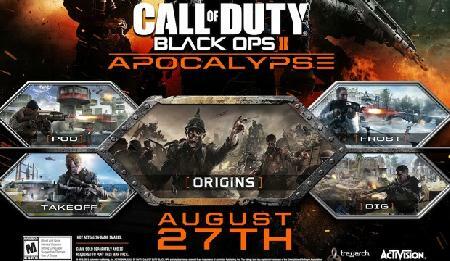 Activision and Treyarch announced today that "Apocalypse", the fourth and final DLC pack for Black Ops 2 that includes four new multiplayer maps and the all-new Zombies experience "Origins", will be available first on Xbox 360 August 27. Other platforms to follow. The epic climax of Activision and Treyarch’s Call of Duty: Black Ops II Downloadable Content (DLC) Season Pass culminates with Apocalypse. Available first on the Xbox Live on August 27th, the game’s fourth and final DLC Pack delivers four thrilling, diverse multiplayer maps and the all-new wildly creative Zombies experience - “Origins”. Dig: An adaptation of the fan-favourite “Courtyard” from Call of Duty®: World at War, where two archaeological dig sites in Afghanistan become the perfect playground for combatants eager for hectic, unceasing confrontations. Treyarch, has retained the spirit of “Courtyard” with two major chokepoints, a wide open layout and raised platforms, but has provided fans with a fresh take on the multitude of paths. Call of Duty: Black Ops II Apocalypse will be available first, exclusively on Xbox Live for the Xbox 360 for 1200 Microsoft Points on 27th August, with other platforms to follow. Players who have already purchased the Season Pass can download Apocalypse as soon as it becomes available. Call of Duty: Black Ops II is rated PEGI 18. For more information on Call of Duty: Black Ops II: Apocalypse, please visit the 360-HQ Xbox 360 video games database or the official site. Currently in development by Crystal Dynamics, Project: Snowblind places unique emphasis to its intensive multiplayer and online play modes. The game puts players in the role of an elite super soldier,..